Get outta my Taskbar, Slack! Q: "Why can't I minimize Slack to SysTray? 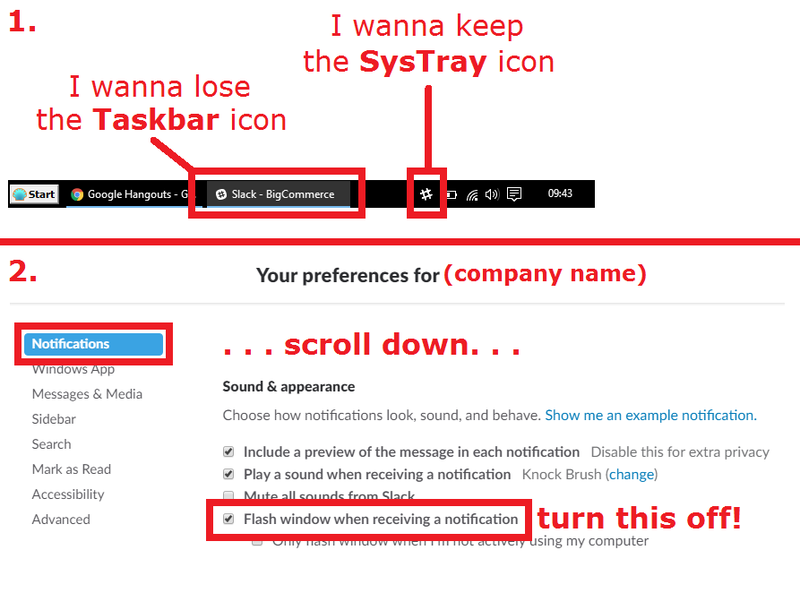 I activated Slack's 'Leave app running in notification area when the window is closed' option. Why does the Slack app stay in my Taskbar?" A: There's a separate setting, "Flash window when receiving a notification", that has to be turned off. Props to mak4k on Reddit for solving this thing that's been driving me nuts for months. 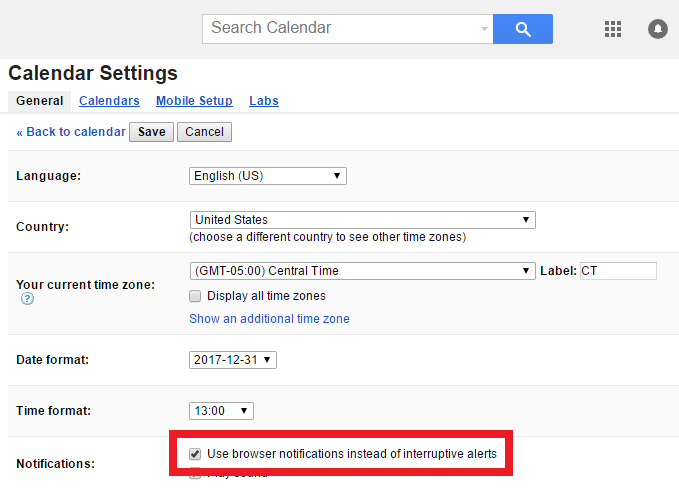 Q: "How do I prevent Google Calendar from annoyingly interrupting whatever I'm doing in Chrome?" 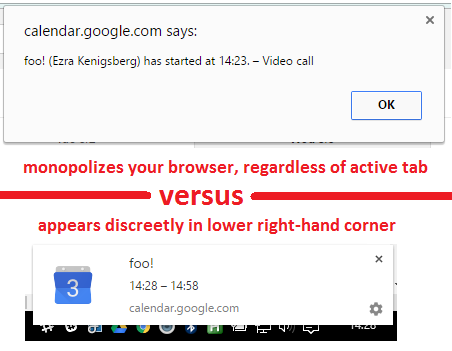 Here's a comparison of the two dialogs. The former is a modal dialog, the latter is a toaster pop-up. Q: "Deployments, Settings, Configurations. . . how can I keep all the Live Agent stuff straight?" A: Try the Live Agent "Object Model" and let me know what you think! 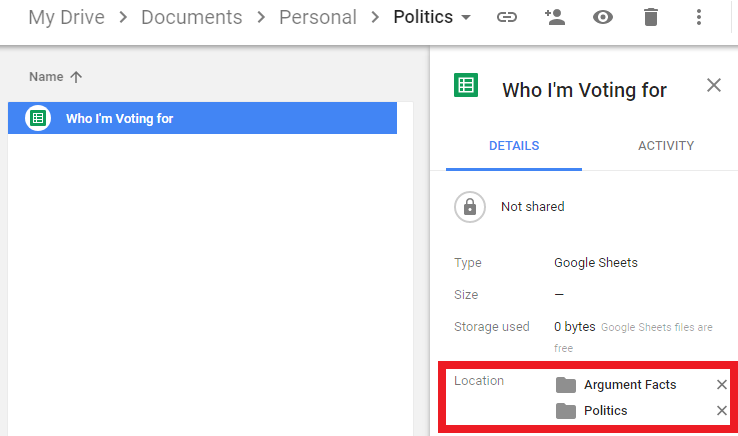 Q: "How do I put a Google Drive file (a Doc/Sheet/Presentation, or any old file) in multiple folders?" 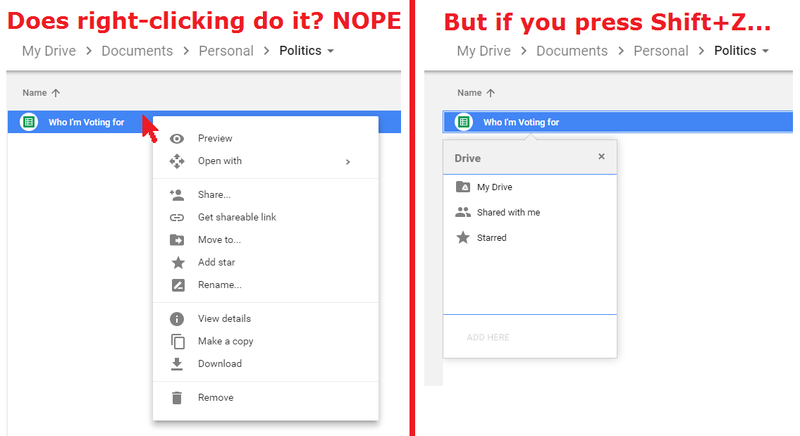 I don't know why the Google Drive people hid this very necessary function in such an obscure corner, but there it is. Once you press Shift+Z and select another folder for the file to live in, that single file will be accessible from multiple folders. How can you know where a file is shared? Details pane! Props to Digital Inspiration for the tip! Q: "How do I set my own defaults (eg, font, size, header rows) for a new Google Sheet?" A: Two answers, depending on the version of Google Sheets you're using. click the "Submit Template" button to establish your Sheet as a template. Sheets' "File | New" command. Create a Sheet that has all the default settings you want. From then on, navigate to that Sheet, then click "File | Make a copy". When does Salesforce automatically create a Campaign Influence record? Q: "When does Salesforce auto-create a Campaign Influence record?" that same Contact is associated to a Campaign (as a Campaign Member). Props to SteveMo for pointing this out first! * I'm not gonna get into Custom Campaign Influence Models here. Q: "How do I access Campaign Influence records via the API?" Turn on Customizable Campaign Influence. Assign user(s) the "CRM User" or "Sales Cloud" Permission Set Licence. Create a Permission Set that includes the "Campaign Influence" App Permission. Assign user(s) to that Permission Set. Followup Q: "What does this do for me?" This BREAKS the old Related Lists on your Campaign and Opportunity Page Layouts. Follow the steps here to set up the NEW AND IMPROVED Related Lists. * This can be addressed by creating an unlocked Custom Campaign Influence Model, but that brings its own challenges (most notably, you gotta create homebrew Auto-Assign Rules using Workflow, Flow, Triggers, or--ye gods--Process Builder). Q: "How do I make a new Google Sheet, quickly?" I just created an AutoHotKey shortcut for myself so that I can get spreadsheeting with Google Sheets almost as fast as I do with Excel. Gasp. After 25 years of Excel (and Lotus 1-2-3; and WordPerfect and Word; and Harvard Graphics and Freelance Graphics and PowerPoint)--will my default "I've gotta make a document" impulse be toward a cloud-based app? Which reminds me: The History of VisiCalc is one of my favorite pages on the web. Nerdriffic! Q: "How do I create bulleted and numbered lists within a cell in Excel?" A: Short answer: download this add-in, activate the add-in in Excel (File | Options | Add-Ins), and use the functions =BULLET() and =NUMBER(). 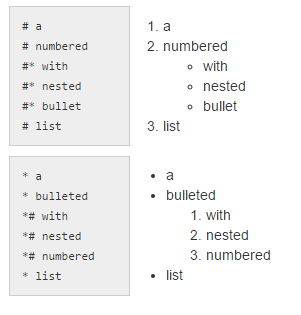 I narrowed the column to show how nicely =BULLET() formats it. Check out those groovy hanging indents. Lovely! Q: "How do I convert a CSV (comma-separated value file) to a TSV (tab-separated value file)?" Copy the code in this post. Paste the code copied in step 1. Save the file as CSV2TSV.vbs into whatever directory contains your CSVs. In Windows Explorer, double-click CSV2TSV.vbs. That should do it! Props to Frank for the question, and to Jojo for the answer!